A monster chunk of ice roughly the size of Delaware finally broke away from an Antarctic ice shelf this week capping months of concern by scientists and environmentalists about the long-term adverse implications for coastal regions. The huge rift completed the separation sometime between Monday and Wednesday of this week, cutting loose more than one trillion tons of ice from the western Antarctica, according to Project MIDAS, a United Kingdom-based scientific team that has monitored the ice shelf via satellite. The new floating iceberg, likely to be named A68, has a volume twice that of Lake Erie. 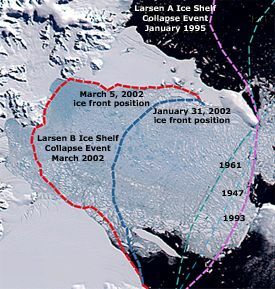 Colored lines mark the Larsen B Ice Shelf edge in 1947, 1961, 1993, and 2002. —NASA MODIS image courtesy of Ted Scambos, National Snow and Ice Data Center, University of Colorado, Boulder. While scientists are reluctant to link the cataclysmic breach in the ice to the effects of man-generated global warming, the latest breakaway of a major section of the Larsen ice shelf is symbolic of the risks President Trump runs in cutting the EPA budget dramatically and taking the U.S. out of the Paris climate change accord.Martin O’Leary, a Swansea University glaciologist and a member of the MIDAS project team, described the breakaway of the ice as a natural event and that “we’re not aware of any link to human-induced climate change. Luckman of Swansea University, a lead investigator, told CNN. Scientists have seen two other sections of the Larsen ice shelf break away and dissolve into the ocean during the past dozen years amid rising global temperatures. They recently began intently watching a serious crack in the Larsen C ice shelf -- one that grew dramatically in the past few months. "We have been anticipating this event for months, and have been surprised how long it took for the rift to break through the final few kilometers of ice," Luckman said. The massive breach this week may not have any immediate repercussions, according to scientists, but it is certain to destabilize further the remaining 20,000 square mile ice mass anchored to land. That would accelerate what some scientists believe is a dangerous rise in sea level that could contribute to flooding as far away as Miami Beach and Louisiana. If the flooding continues unabated, scientists warn, many coastal communities in the U.S. and elsewhere could literally disappear, millions of people would be displaced, and naval and military installations around the world vital to U.S. interests could face serious damage or destruction. The newly created mega-iceberg is floating and will not immediately raise sea levels, the researchers claim. However, if the remaining shelf loses much more of its area, that could result in non-floating glaciers projecting off the land that would eventually have some impact on sea levels.